We attract more buyer agents and brokers to visit the property by organizing frequent open house. We also pay thousands of dollars for the professional photos, the home inspection report, etc. to sell your home before we are paid, at no cost to the seller. We definitely put more money in your pocket! to the property and make more offers. More and more buyers these days prefer to check properties at an open house by themselves. It is very important that the seller hires licensed brokers to post an open house event on MLS. If not, the open house date & time is only published on a third party website and remains unseen by most agents and buyers. Olaie can pay a professional photo studio to take at least 25 high-quality photos of the property at no cost to the seller. We may even take drone pictures and have a 3D tour of the property. Professional photos attract more online viewers, more buyers to visit the property, and more buyers to make offers. Olaie can pay a licensed inspector for a home inspection report at no cost to the seller. 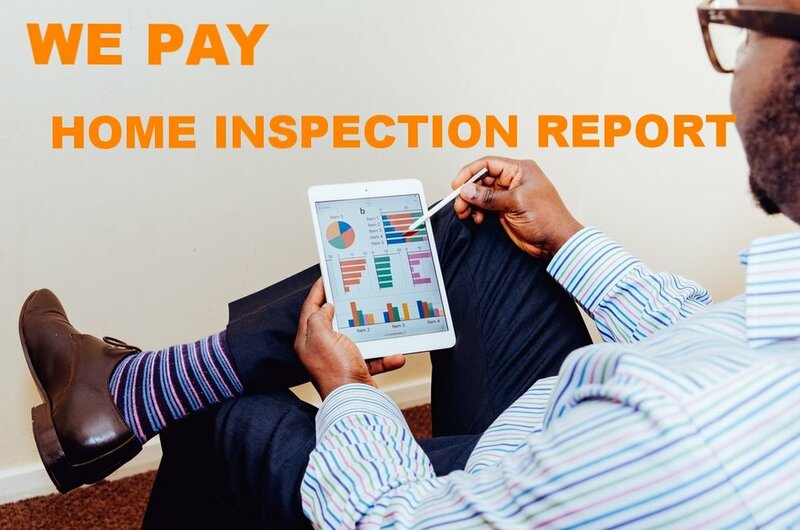 The home inspection report will encourage many more buyers to make offers that waive inspection contingencies. OIaie can repay the seller's repair and staging expenses for selling the property at closing, up to 1% commission. We encourage the seller to paint, landscape, repair the property before listing the property and to hire a professional staging company to stage the property to solicit higher bids from more buyers. At closing, we will refund such expenses to the seller, up to 1% of sale price. allows listing property at a competitive price to solicit more offers from more buyers. The seller can keep more money in the pocket at closing. We also provide other flexible pricing plans so that the seller can select additional stellar services from us. The seller is free to set a commission to the buyer's agent (usually 3%). Olaie helps the seller reach international buyers. Our brokers speak multiple languages including English and Chinese. Your listing will also be published on our multilingual website and Chinese social media to attract wealthy overseas buyers. olaie is committed to our sellers. we pay thousands of dollars to sell your home before we are paid and put more MONEY in your pocket! 1. Fill out the Contact Form to receive by email a detailed Property Value Analysis (sample Property Value Analysis) for the Listing Price of your property, which includes Property Detail, Comparables, Market Trends, Neighbors, Neighborhood Profile, Assessor Map, and Flood Map. NO OBLIGATION! TOTALLY FREE! 2. Feel free to email us at service@olaie.com or request us to call you to answer any of your questions. We will never cold-call you or send you solicitation emails unless you request them. HASSLE FREE! 3. Once you decide to hire Olaie as your listing agent, email us at service@olaie.com about the PRICING PLAN that you want to select. We will then email you a simple listing agreement and sale documents for you to electronically sign online. There is no need for a fax machine or printer. 4. We will schedule a preliminary title report, a photo-shoot of your property, and a home inspection depending on your PRICING PLAN. You can expect that both your MLS listing and open house within TWO WEEKS of signing the listing agreement. If you require rush processing, please let us know. 5. We will diligently find DOMESTIC AND OVERSEAS BUYERS and negotiate offers on your behalf. We will use different strategies, such as counter-offer and second chance offer, to solicit the best offer for you. We will guide you through the whole process until your property is SOLD AT THE PEAK PRICE!